Look for our Check Your Neck coin canisters in SLGA liquor stores in Regina, Saskatoon, Prince Albert, Moose Jaw, Nipawin and Fort Qu’Appelle SK for the month of September 2018. Donna Miniely, past president, has raised $3,000 since 2014 with this event as well as bringing awareness of thyroid disease. We wish her continued success this year. 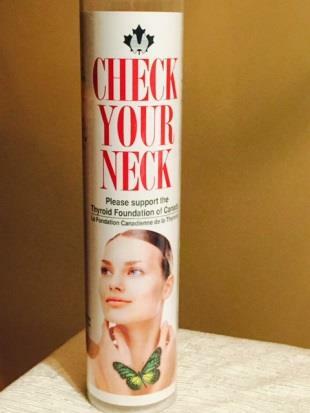 Please support our Check Your Neck campaign. Funds collected support our Thyroid Awareness programs.